Half a star extra for this cold turkey of a comedy for not smashing expensive cars. Yes, folks, Rohit Shetty has actually made a Golmaal film without speeding cars crashing into one another. And that’s about the sign of maturity you will see in this franchise which seems designed for the mentally challenged. Car crashes are the least of the worries in this, the fourth and arguably the unfunniest film in the Golmaal series. There are other catastrophes awaiting our attention in this stretched-out horror of a comedy…. Don’t look at me. That’s what this mélange of comedy and horror aims to be and ends up being neither. The writing is so frail as to be almost non-existent. From Frame 1, the narrative saturates itself with bright inviting colours in the hope that they would dazzle us into surrender and acceptance. There is, however, a quivering absence of credibility and self-control in the narration. Equipoise is non-existent in Shetty’s screaming scheme of entertainment. Throughout we see the team’s desperation to get noticed. Hence Tusshar Kapoor’s mimicry of a mute man’s monosyllabism is twice as insolent as compared to the earlier films in the farcical franchise. Shreyas Talpade’s lisp is far more aggravated. And Sanjay Mishra’s nonsensical lines based on references to celebrated people (e.g “Justin Bieber ke besure aulad”) is three times more nerve-grating than medically acceptable. Throughout this non-stop binge of vapid gags Ajay Devgn remains sportingly in the shadows, blending with his co-stars’vantics which include getting into Talpade’s lap each night as he sings a parody version of the Lata lullaby Zu zu zu zu, with a touching team spirit that would have held him in good stead were he doing a film about, say, a football team fighting to win against all odds. Here, Devgan’s sporting spirit is sadly misused to give the film a misleading face-value. Many other enormously talented actors like Sanjay Mishra, Sachin Khedkar, Kunal Khemu and Ashwini Kalsekar are content playing perky props in this droopy comedy-horror where it’s hard to say when the comedy ends and the horror begins. Parineeti Chopra playing a ghost looks lost and ill-at-ease. Maybe she took her ‘spirited’ role too seriously. As for Tabu, as she grapples to make sense of her presence in this dull and pointless energizer she almost looks like she was waiting for Gulzar to rescue her from a predicament worse than death. Indeed if there is a real hero in Golmaal Again it is Nana Patekar who not only appears as a leading leitmotif in the ghost roast, he also makes a guest appearance in voice and person in several scenes that are in dire need of spicing up. A bewildering blandness runs through this instalment of the Golmaal franchise. Not that there is any dearth of activity and counter-activity. The camera and the background score (which, includes a refrain from Lata Mangeshkar’s immortal Kahin deep jale kahin dil, no less) are constantly on the prowl. But in vain, it’s like hunting for paper tigers in an artificial jungle. 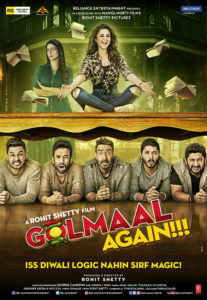 Everything about Golmaal Again is compromised and corrupted. Every character speaks his lines with a growing hopelessness. One whole gag involves characters driving up to Devgan to ask what he’s doing standing there. 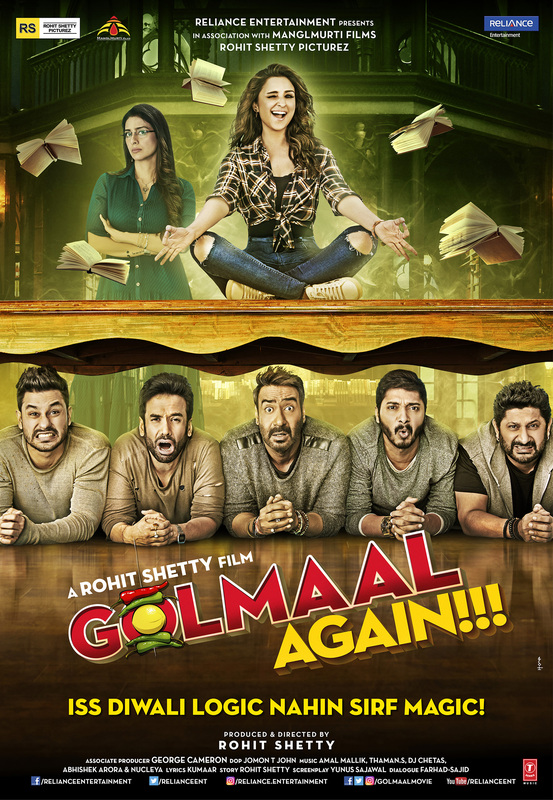 It’s as if the team decided to make one more Golmaal film because they hadn’t done so for a long time. And dammit, it’s Diwali. Do audiences want to watch this kind of mindless bacchanalia where just about the most interesting thing you will see is the National award-winning Prakash Raj writhing and pounding his pelvis to a cheesy rhythm? That’s three National award-winning actors in one helluva compromised condition that they’d find hard to explain to their children. 16 queries in 0.474 seconds.